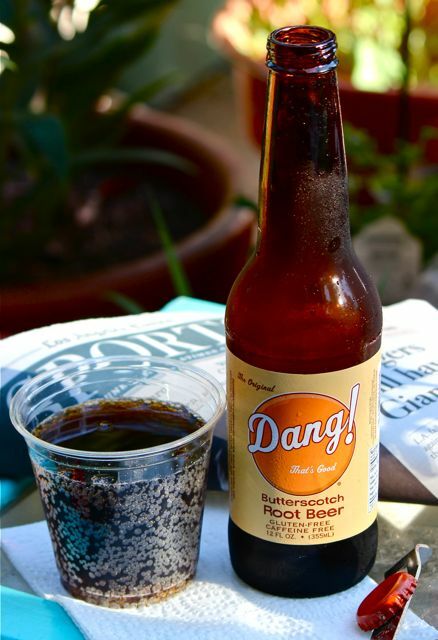 Any soda company that calls itself Dang! That’s Good had better be good, and any soda called root beer coming out of the beer capital, Milwaukee, had better be better. Vanilla is a component of root beer, so why not butterscotch? Here’s the lowdown, short and sweet. What’s in it: Carbonated water, sugar, natural and artificial flavors, caramel color, citric acid, sodium benzoate (preservative). Appearance: Deep brown; loads more bubbles cling inside the cup than rise to the top; no head. Flavor: Root beer on the first sip; butterscotch becomes more pronounced on subsequent sips until the root beer flavors become secondary. Nice bubbles all along the ride down the hatch. Finish: Butterscotch lingers, then fades to root beer flavors. Pairings: This is sort of a dessert drink among root beers, so I choose Vienna Finger cookies or angel food cake. Notes: I found myself savoring the finish, mumbling, “Umm, that’s good.” Dang!